The following triple net lease form is designed for a single tenant build to suit transaction, where the landlord builds the entire premises for the tenant. The rent payable by the tenant is pegged to the total construction cost of the project, and it is then stepped up annually on a percentage basis. The landlord also receives warrants from the tenant as additional rent. This Lease (“Lease”) is made as of _________________, ("Effective Date") by and between COMMERCIAL PROPERTY LANDLORD, INC., a __________________ corporation (“Landlord”), and AGREEABLE TENANT, INC., a _________________ corporation (“Tenant”). Section 1.01. Demise. For and in consideration of the rents, terms, covenants and agreements hereinafter set forth on the part of Tenant and Landlord to be paid, kept, observed and performed, Landlord does hereby demise and lease to Tenant, and Tenant does hereby take and hire from Landlord, upon and subject to the terms and conditions contained herein, that certain tract of land located in ________________, being more particularly described on Exhibit "A" attached hereto and by reference incorporated herein (the "Site"), together with all Improvements (as hereinafter defined) now or hereafter located thereon and all appurtenances thereunto belonging, together with the non-exclusive right and easement to use the property described on Exhibit "A-1" attached hereto and by reference incorporated herein ("Access Tract"), for the purpose of pedestrian and vehicular access, ingress and egress to and from ___________ (subject to payment of the Shared Costs therefor in accordance with Section 3.04 hereof) (said Site, Improvements, including, without limitation, the Building (as defined in Section 2.03) and appurtenances hereinafter collectively referred to as "Premises"), subject to the encumbrances set forth on Exhibit "B" attached hereto and by reference incorporated herein. A plat of the Site is attached hereto as Exhibit "C" and by reference incorporated herein. 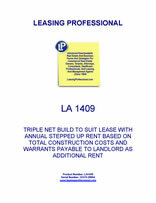 The term "Improvements" as used in this Lease shall mean any and all structures and appurtenances thereto of every type and kind on, at or under the Site, including, but not limited to, buildings, outbuildings, garages, sheds, patios, patio covers, awnings, additions, walkways, bicycle trails, sprinkler systems or pipes, garages, roads, curbing, paving, driveways, parking areas, fences, screening walls, retaining walls, stairs, decks, fixtures, landscaping hedges, windbreaks, poles, signs, exterior tanks, solar panels and equipment, exterior evaporative coolers, air conditioning and water softener fixtures, wind mills, exterior antennae, aerials and other equipment for the reception or transmission of radio, television, microwave, electromagnetic, or other similar or dissimilar communication systems, and any improvement or any device that alters the natural flow of water from any property adjoining the Premises. Section 2.01. Term of Lease. The term of this Lease (hereinafter referred to as "Term") shall commence on the date first set forth above, and unless sooner terminated or extended under the terms and conditions contained herein, shall continue thereafter until 11:59 p.m. (local time) on the day preceding the tenth (10th) anniversary of the "Rent Commencement Date" (as hereinafter defined). "Rent Commencement Date" shall mean the later of (i) the date one hundred fifty (150) days after the Floor Ready Condition Date (as defined in Exhibit "D") subject to extension for delays in Substantial Completion of the Tenant's Work arising out of any Landlord Delay or Excusable Delay (as such terms are defined in Exhibit "D"), or (ii) the date of Substantial Completion of the Base Building Work (as defined in Exhibit "D"). Section 2.02. Options to Extend Term. Tenant is hereby granted options to extend the Term of this Lease for two (2) successive additional periods of five (5) years each (each such additional period being herein referred to as an "Extended Term") by giving written notice of such extension to Landlord at least nine (9) months prior to the expiration of the initial Term of this Lease or the first Extended Term, as the case may be. Tenant shall have the right to exercise these options to extend provided that on the date of such exercise no Event of Default (as hereinafter defined) under this Lease has occurred and is then subsisting. Each Extended Term shall be upon all of the same terms, covenants and conditions of this Lease then applicable except that the Rent (as hereinafter defined) during the Extended Terms shall be as set forth in Sections 3.02 and 3.03 hereof. The term "Term" or the phrase "Term of this Lease" as used in this Lease shall mean the initial Term and any Extended Term which may become effective. Section 2.03. Supplemental Agreement. Landlord and Tenant shall, within twenty (20) days after the occurrence of the Rent Commencement Date, execute a supplemental agreement setting forth the Minimum Rent, the number of rentable square feet contained in the building to be constructed on the Site pursuant to Exhibit "D" (the "Building"), the Rent Commencement Date and the expiration date of the Term of this Lease as determined pursuant to Section 2.01 hereof and the dates for Minimum Rent adjustments as determined pursuant to Section 3.02 of this Lease. Such supplemental agreement, when executed and delivered by Landlord and Tenant, shall be attached to and become a permanent part of this Lease. Section 3.01. Minimum Rent. Tenant covenants and agrees to pay Landlord, in lawful money of the United States of America, for the period commencing on the Rent Commencement Date and continuing thereafter throughout the Term, as rent hereunder, (i) Minimum Rent (as hereinafter defined), plus (ii) any and all additional rent consisting of such sums and charges that come due under the terms and conditions of this Lease other than Minimum Rent (any and all such sums and charges hereinafter referred to as "Additional Rent"). The Minimum Rent and Additional Rent are sometimes herein collectively referred to as "Rent". For the period from the Rent Commencement Date to the day preceding the first (1st) anniversary of the Rent Commencement Date, "Minimum Rent" shall mean a base annual minimum rent in the amount (the "Initial Minimum Rent") equal to twelve percent (12%) of Landlord's Total Cost (as hereinafter defined). Commencing on the first (1st) anniversary of the Rent Commencement Date and continuing on each subsequent anniversary of the Rent Commencement Date, the Minimum Rent shall be adjusted as provided in Section 3.02 hereof. "Total Cost" means the costs and expenses paid or incurred by Landlord in connection with the development of the Premises and shall include, without limitation, the matters set forth on Exhibit "F" attached hereto and by reference made a part hereof, including but not limited to imputed land acquisition costs in the agreed amount of $__________ per acre, grading costs, the costs of constructing and installing landscaping, irrigation, and drainage facilities, curbs, gutters and paving, and other site work, the costs of the Base Building Work, a development fee to Landlord or an affiliate of Landlord, in the amount of $__________, leasing commissions, permit and tap fees, impact fees, architect's and engineer's fees, legal fees, property taxes, the Improvement Allowance, and imputed interest (identified on Exhibit "F" as "Financing Costs") at the rate of eight percent (8%) per annum on all such costs from the later of date of disbursement or the Effective Date of this Lease through the Rent Commencement Date (or such earlier date upon which the Rent Commencement Date would have occurred but for Landlord Delay); provided that until the date of Substantial Completion of the Base Building Work the imputed land acquisition costs shall not be included in the costs on which such imputed interest shall be determined. The amounts set forth on Exhibit "F" are estimates as of the date of this Lease of the Total Cost and of the amounts of the elements comprising Total Cost, which estimates may and almost certainly will change, and which estimates do not and shall not be deemed to set either minimum or maximum limits for such elements or for the Total Cost. For purposes of illustration, as set forth on Exhibit "F", if the Total Cost were $____________, then the Initial Minimum Rent would be $__________ per annum, equal to ________ percent (___%) of $____________ [___________ Dollars ($________) per rentable square foot (based on the Building containing an estimated _________ rentable square feet; provided, however, that the actual number of rentable square feet shall be determined as hereinafter set forth)]. Not later than ________ (___) days after the Effective Date of this Lease, Landlord shall provide to Tenant an updated estimate of the Total Cost, which shall supersede Exhibit "F" hereto. The number of rentable square feet in the Building shall be determined in accordance with the American National Standard Method of Measuring Floor Area in Office Buildings, ANSI/BOMA Z65.1-1996 published by the Building Owners and Managers Association International ("BOMA Standards"). Upon Substantial Completion, Landlord will cause its architect (which architect shall have not less than five (5) years experience in the design of commercial buildings and shall have expertise in measuring and calculating the rentable square feet of commercial buildings using BOMA Standards) to make and certify to Landlord and Tenant physical measurements of the Building and the resulting calculation of the number of rentable square feet contained within the Building in accordance with BOMA Standards, and a copy of such certification of Landlord's architect shall be given to Tenant. Minimum Rent shall be payable, in advance, in twelve (12) equal monthly installments for each Lease Year (as hereinafter defined), on or before the first day of each calendar month during the Term, at the office of Landlord, or at such other address as Landlord may from time to time designate in writing to Tenant. Landlord agrees that Tenant shall have the right, if it elects, to pay Minimum Rent by means of a wire transfer of immediately available Federal funds to the account of Landlord, and upon request by Tenant, Landlord agrees to provide Tenant with Landlord's account information and wiring instructions to enable Tenant to make payment of Minimum Rent by wire transfer as aforesaid. Minimum Rent for the first and last months of the Term shall be prorated on a daily basis if the Term shall begin or end on a day other than the first or last day of a calendar month.